Now on to the side panels—I am going to pick up 4 stitches first—and make the side panels deeper than the miter. This will allow me to make the back wider (the front panels will have a gap) and make the whole vest fit better. 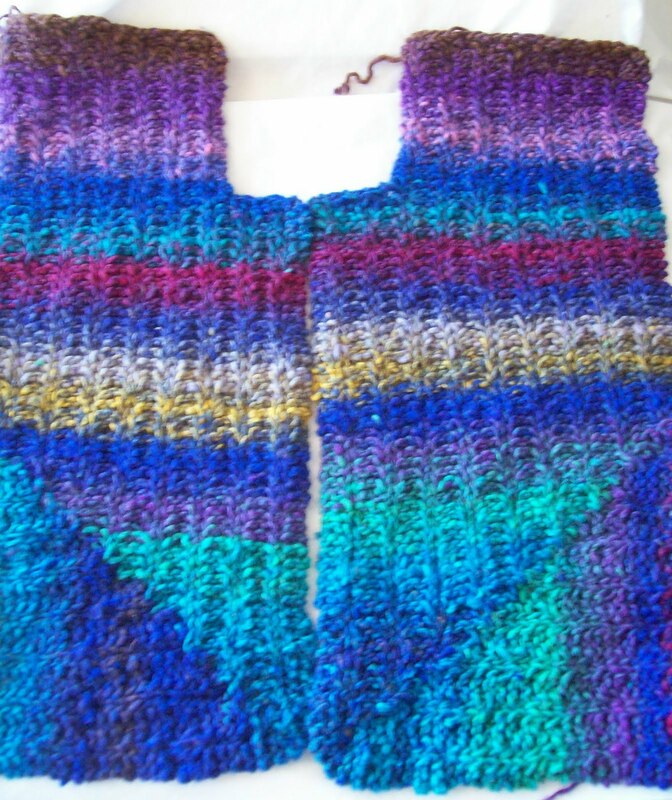 I've used about 1/3 of the yarn so far—I should have enough—the side panels won't take up a third—but the wider (and slightly longer) back panels will take a slightly more than a third. If there is left over, maybe a collar or front band to use up the last bits.. (or maybe I am being overly optomistic about the amount of yarn I have!) But a front band (crosswise band) would help hide the few rows difference in color banding.. and make the center front mis match less obvious. Yesterday's mini skeins have been balled up—I definitely want to start a hat with the tri color skein—and while I haven't cast on for socks (they are going to wait till the vest is done) I have moved the bag of red, white and grey yarns front and center, and tucked a pair of needles into the bag, and small ruler, too. 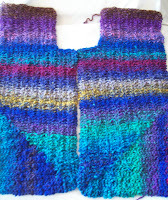 So I am ready to go with them as soon as this vest is finished. (or knit up, if not completely finished. March's socks are going to be top down socks...and aside from the puffy stripes (rows of reverse stocking knit alternated with standard stocking knit) pretty much plain jane socks.